Yesterday I went to Glasgow for the second day of the Tapestry Partnership event Learning and teaching and all that jazz. I had heard great things about the day before, when Nigel Osborne had masterminded the performance of 1000 Scottish primary children with Beats from Brazil and the Tapestry Jazz Radio Orchestra. 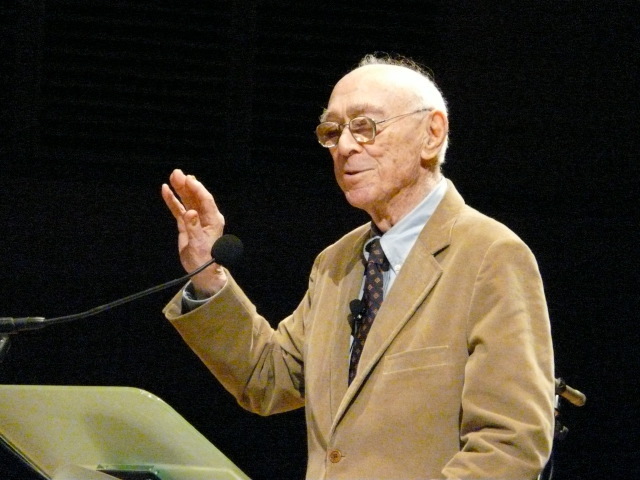 But on Friday, I had two incentives: one was to hear Jerome Bruner, whose thinking I have admired for 40 years, and the other was a dinner in his honour at the Hotel du Vin (1, Devonshire Gardens). Any subject can be taught effectively in some intellectually honest form to any child at any stage of development. This bold claim has been the subject of ill-informed ridicule by people who think it's obvious that you can't teach calculus to a young child. But a very young child on a swing can experience acceleration and slowing-down, and may feel how the rate of change varies at different parts of the arc ... If so, he or she is well on the way toward an enactive understanding of calculus. Combined with Bruner's powerful notion of the spiral curriculum, in which children revisit subjects while moving from enactive to iconic to symbolic levels, this challenges the lamentable dumbing-down which results from underestimating what and how children can learn. It was a pleasant surprise to hear that a man who had risen to fame in the post-Sputnik era was still alive, let alone able to travel to Glasgow and perform in public. Yesterday he held 800 teachers and others spellbound. He was not merely "amazing for a man in his 93rd year", he was simply amazing. Lucid, articulate and able to draw on a long, rich lifetime of experience, this was no routine lecture. Bruner (unlike many other Tapestry lecturers) had found out a great deal about Scottish education, had related his message to the Curriculum for Excellence and was confident enough to depart from his script. He had that remarkable knack of engaging with his audience, who rewarded him with a well-earned (but unprecedented) standing ovation. And over dinner, I was lucky enough to be in conversation with this erudite, modest and charming man. I made the most of it. Here was my chance to ask about his journey from Harvard to take up his Chair at Oxford: he had skippered his 42-foot yacht across the Atlantic to take up this post, as you do, he explained, because shifting it by other means would have cost a silly price! He seemed to be enjoying his stay in Glasgow, having gone to Nigel Osborne's opera Differences in Demolitions the previous night, and fitted in a visit to Kelvingrove Art Gallery that afternoon. He kindly signed my copy of The Process of Education. This highly collectable book will never be up for auction on eBay, at least not in my lifetime! This page contains a single entry from the blog posted on May 31, 2008 6:17 PM. The previous post in this blog was London Book Fair 13-16 April. The next post in this blog is Nigel is 60.